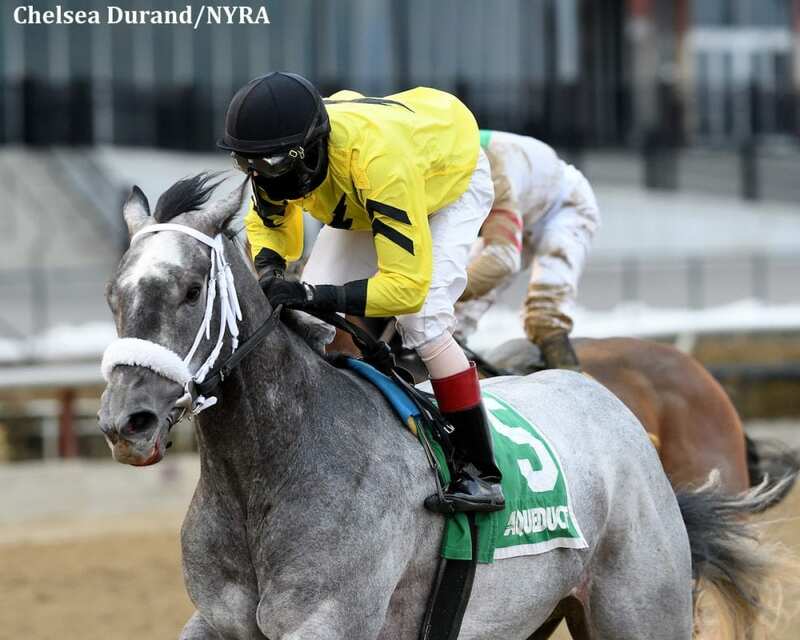 SJB Stable and Marcello Micozzi's Skyler's Scramjet won his graded stakes debut in impressive fashion, gaining the lead out of the turn and outkicking Do Share in the stretch to capture the 43rd running of the Grade 3, $200,000 Tom Fool Handicap for 4-year-olds and up on Saturday at Aqueduct Racetrack. Veteran graded stakes winner Green Gratto went to the front, setting fractions of :22.47 seconds for the quarter-mile and the half in :46.55 with Skyler's Scramjet giving pursuit. Jockey Trevor McCarthy guided the 4-year-old Creative Cause gelding to the lead, going three-wide in the upper stretch, and completed six furlongs in 1:11.38 to win by 1 1/2 lengths. Off as the 5-2 favorite, Skyler's Scramjet, carrying 115 pounds, won his third straight start and his fourth in his last five races for trainer Michelle Nevin. He paid $7.10 on a $2 win wager and increased his career bankroll to $292,872. Runner-up Do Share, making his 2018 debut for trainer Linda Rice, finished in the money for the 11th consecutive time, hitting the wire three lengths ahead of Great Stuff in third. Life in Shambles, Classy Class, Spartiatis, Threefiveindia, Candid Desire and Green Gratto completed the order of finish. Favorite Tale was scratched. This entry was posted in Racing and tagged Marcello Micozzi, michelle nevin, SJB Stable, Skyler's Scramjet, Tom Fool Handicap, trevor mccarthy by Brian Bohl/NYRA. Bookmark the permalink.